​F4E’s Diagnostics Project Team is celebrating the successful completion of neutron testing of the diagnostic sensor prototypes, based on Low-Temperature Co-fired Ceramic (LTCC) technology, which will be installed in the ITER Vacuum Vessel, the heart of the ITER machine. 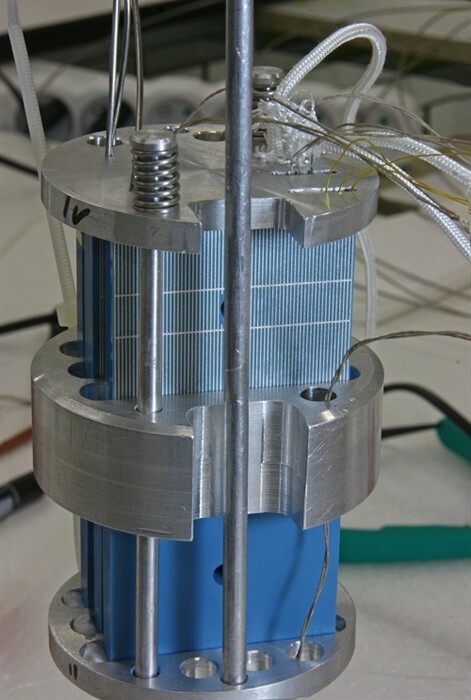 Testing was carried out on behalf of F4E by Belgian (SCK-CEN) and Czech (REZ) laboratories, and focussed on assessing whether, once installed, the diagnostic LTCC sensors will be able to withstand the exposure to neutrons which will be created during the fusion process in ITER. With ITER currently being built, it is not possible to reproduce an exact replica of the ITER environment at the present time, so a testing method using two existing low and high neutron flux fission reactors was developed. What exactly do the diagnostic LTCC sensors do? They can be likened to eyes of the ITER machine, measuring the magnetic field around the plasma core and thus yielding vital information regarding its position and shape. In total the ITER machine will house more than 1500 magnetic field sensors of various different types, but neutron testing has focused on two varieties, both based on LTCC, which will be most exposed to neutrons in ITER. Prototypes of these sensors subjected to neutron testing were manufactured by EPFL (Switzerland), Via Electronic (Germany) and VTT (Finland). “The results from testing have been very encouraging”, says Shakeib Arshad, who is responsible for Magnetics Diagnostics at F4E. “We were happy to see that all the LTCC sensor prototypes survived. The testing also provided data regarding the sensors’ electrical performance in the presence of neutrons. Minor differences were noted in the behaviour of the various prototypes related to differences in manufacturing details and these observations will help optimise the final design. We are pleased because these results mark successful conclusion of a complex development plan, spanning several years”.